There are two main benefits to use a putter with zero degrees of loft. In the 2 minute video below I demonstrate these benefits. The first benefit of zero degrees of loft is the ball gets rolling more quickly and tracking on the target line. I posted another slow-motion video below that shows the difference in zero degrees of loft launching the ball a shorter distance and rolling with topspin sooner. To help understand this concept a bit more let's look at a more extreme version of getting the ball to roll quickly with topspin. Visualize in your mind’s eye someone topping off an iron shot. The ball barely comes off the ground for the first few feet before it starts to run on a straight path. Any bump the ball encounters hardly affecting the straight path and the ball continues to roll straight. This happens to a putter with zero degrees of loft but on a much smaller scale. The ball launches for a few inches before the ball starts to roll on the target line. The second benefit of zero degrees of loft is the changes in lie angle of the putter do not affect the direction. Again, to better understand this concept lets look at a more extreme version with an iron. What happens when the ball is stuck with an iron that toes up for a right-handed player? The answer is the ball will go left of the target line. The converse is true if the toe is down; the ball will go right to the target line. This same effect happens during putting but on a much smaller scale. The fact becomes more evident on longer putts as the small degree in which the ball moves offline becomes more apparent. Zero degrees of loft will work for most players. However, if you are a player that plays a forward press and can maintain the hands in front of the be putter head at impact, then you should not play a putter with zero degrees of loft. Furthermore, zero degrees of loft will not work for players that place the ball back of the middle of their stance. Alright this is our final update from Japan on our 3D printed putter project. Again our goal is to make it to 100 putter designs in 2018. I think we are around 30 designs already. Sorry for the delay in the updates. Here is another update from when we were in Japan for the Japan Golf Fair we finally had some time to edit the video. Japan has been an incredible inspiration for Kronos Golf design. The video takes you through Kansai to Kanto areas from Kyoto to Hyogo to Tokyo. We find the juxtaposition of heritage and technology bring out the beauty in both elements that make up portions of Japan. Likewise we try to achieve the same balance in our classic designs filled with modern manufacturing methods. This video shows a quick walk through of the Japan Golf Fair 2018. The show is pretty small and intimate. We wanted to thank those who came out to support us and we hope to see you guys out there next time if you missed this show. Here is a quick video review of a handful of putters that we showed at the Japan Golf Fair. You might recognize some of these putters from the CAD drawings listed in our previous updates on our 100 putter designs for 2018. I designed another classic model putter that we are all familiar with the shape, but added some holes to the heal and the toe to put tungsten weights to create a higher MOI putter with a slightly heavier feel. You can probably see a theme in most of my designs is to maintain the classic shape or profile of a putter, but change the underside or small areas that are not visible at address to improve or change the feel of the putter. My goal as a designer for most of my designs is to make changes that are not visible to the player but can be felt by the player. One of my first 3D printed putter was a version of this putter with a pocket on the sole. In this version I made the putter a bit heavier and got a little funky on the sole of the putter. Check the CAD screenshots below. I love these classic lines. I made the curve on the toe a little tighter with a smaller radius to make it look stronger where the heal curve is a bit longer which turned out to be a nice contrast to the toe. This putter is another version of the putter that had the short neck in our first video in early February explaining the goal of 100 3D printed putters for 2018. This putter doesn't have a neck and really on a bend in the shaft to create the offset and lie angle. Additionally, we altered the picket and the geometric figures in the pocket for sound. Yes we have all seen this design... Fun thing is this one is actually balanced!! In the photos below there is a little blue and white dot that kind of looks like the BMW symbol. That is the center of mass or center of gravity. I did two designs here one that is a very traditional look and the second more of a cosmetic funkiness to the Kronos on the back-face. I played around with different sight lines/ sight dots because the rising toe angle makes the center of mass symbol look like it is off-center when looking at the putter from different angles. 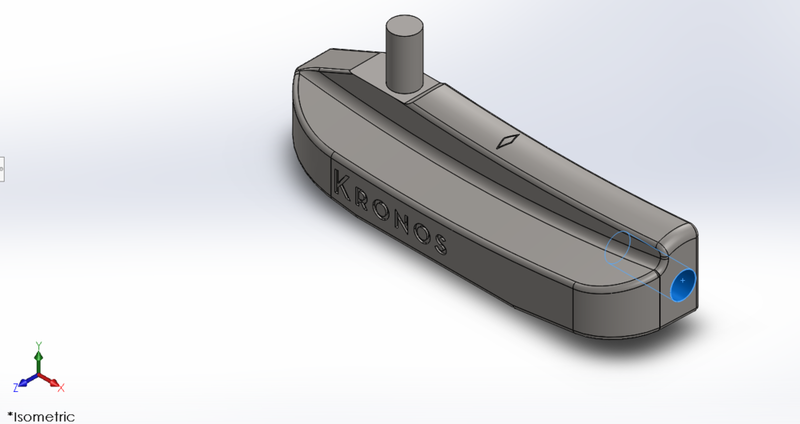 Stay tuned for more updates on this one in a video review when the putter is finished 3D printing. For the past two years Kronos has sponsored a senior project at Mechanical Engineering Department at Cal Poly San Luis Obispo University. One of my students came up with the general shape of this putter and I changed it a bit to have different lines and a different set up. Part of this goal of modeling 100 different designs for 2018 is to think outside of the box. This putter definitely does exactly that. I am looking forward to testing this putter out on the course and giving you my feedback in a video review. Got some input from a Linksouldier aka an employee over at Linksoul in this case. Did a more squared off version from what I have seen for this style design. I had a little more fun with the second design here. I added a little cut out in the flange to create more of that B shaped look. These putters will be nice for those guys that want a nice in between a traditional blade and mid-mallet style putter. Does this shape look familiar?? Can you tell the difference between these two heads? These two models are designed using the same framework as our Anchor model putter. We shifted the shaft entry more towards the heal as we showed on our Anchor 2 model that was 3D printed and we explained a short video. Take a look at the screen shots of the CAD drawings closely. I highlighted some of the small changes to create a different look and feel. I plan to 3D print these out of metal so stay tuned on the video update on these two guys. I am excited to introduce two more 3D printed putters that are fully functional and ready for play on the golf course. Here is a short video covering the two designs. Just messing around and tried to create a super high MOI putter regardless of look. Yes it is ugly!! Although I attempted to keep simple lines. The large channel down the middle was inspired by the two ball because the diameter of the circle and the width of the channel are that of a golf ball, 1.68 inches. Moment of Inertia along the Z axis is 11,505.06 at 384.38 grams. Length from heal to toe is 4.5 inches so this would look like a traditional length putter rather then the other high MOI putters out there that go to 5 inches to 5.5 inches to achieve a lower MOI and at a higher weight. I am still deciding if I will actually make this one. 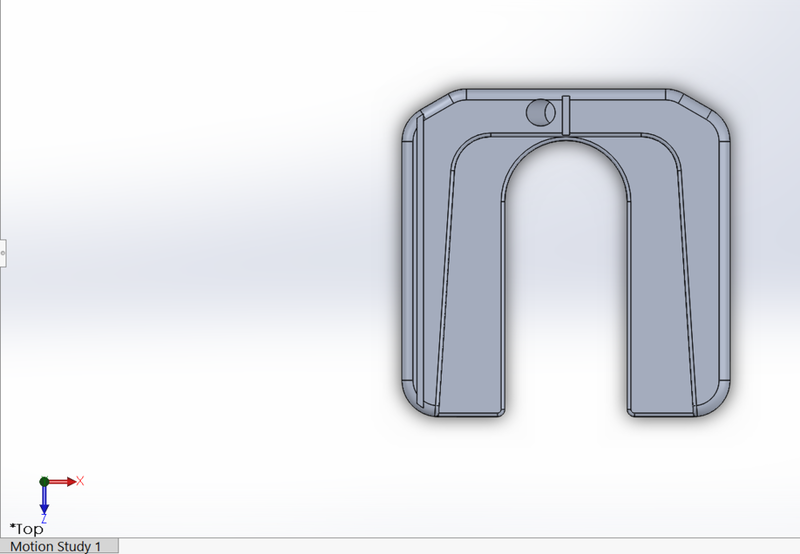 The cool thing is there are holes in the bottom that will allow for added weights to bring the MOI even higher. For now I am going to try just printing a high definition metal flake infused plastic before making a real Aluminum head. A customer requested a hammered look on the back of a D'Arcy. We have done sone of these hammered ones in the past with our Prosecco Rose PVD coloring and those turned out great, but I wasn't too sure how this one was going to come out. Its hard to really capture the real look of the finish because my phone camera isn't the greatest at taking photos of shinny metal, but the putter in real life looks as in my wife's words "really awesome!" Here is a scrap Touch model putter I used to practice the hammering on. 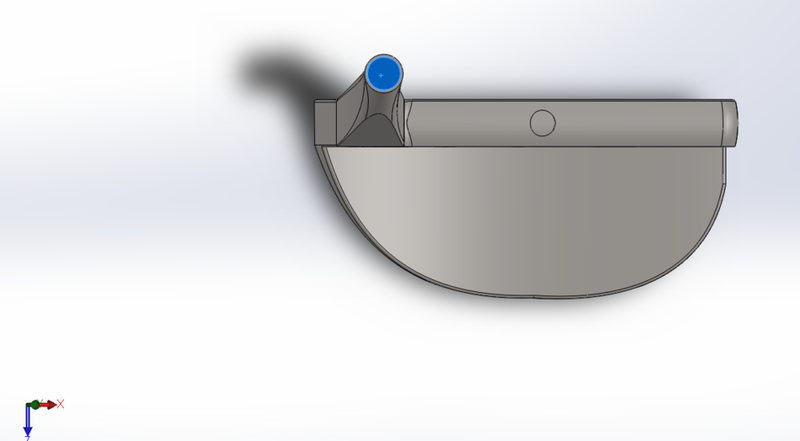 Here is a quick putter design inspired by M. McKenna who submitted a suggestion on a putter design. Did a couple versions of this model and I am looking forward to giving a video update on how it turned out soon! Design must be driven by purpose. Since the start of the company we have learned a lot about design from not only using putters and testing putters but from other companies and people that we have worked with. We had the opportunity to work with Linksoul, Blast Motion, and some touring pros. In each case we found that there is always a goal in mind for the functionality of our putters and at the same time a specific look our partners were going for. 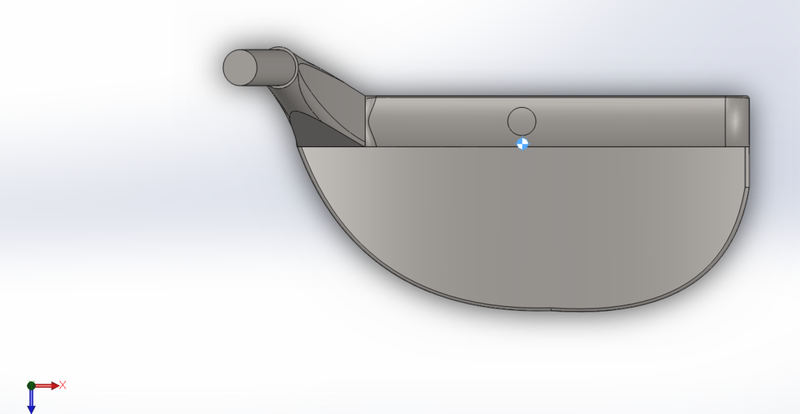 For me personally, to be called a putter designer, it isn’t just simply being able to CAD the design because anybody that knows how to CAD can design a putter (you could say the same about hand sketching). To truly design you must take these inputs such as center of gravity, MOI, feel, sound, material, hosel offset, hosel placement, hosel type, shaft type, and overall shape (blade vs mallet) and be able to incorporate all these futures while still having the putter function in the way you intended. For example, are we looking to get the ball to roll more quickly? Are we looking for a model with high MOI? Are we trying to create a dynamically balanced putter with no bias to toe hang in any direction? I think putter manufacturing is going to change drastically in the next 5 to 10 years. The conversation now around rapid prototyping and 3D printing functional putters out of metal will be the norm in 10 years and the larger companies will be forced to evolve. These companies are already evolving in the sense they are diversifying their portfolios by acquiring more lifestyle focused companies meaning they are less focuses on manufacturing because they are seeing that people are unique and don’t want to buy off the shelf anymore which is troublesome for the current paradigm. I predict in the future people will be able to choose a design and it will be easily modified to their liking and it will be printed. The focus will be more on fitting length, lie, shaft stiffness, head weight, alignment, hosel offset, to name a few. In other words true putter fitting. Here on this platform I am looking to explore different ideas with the golfing community. 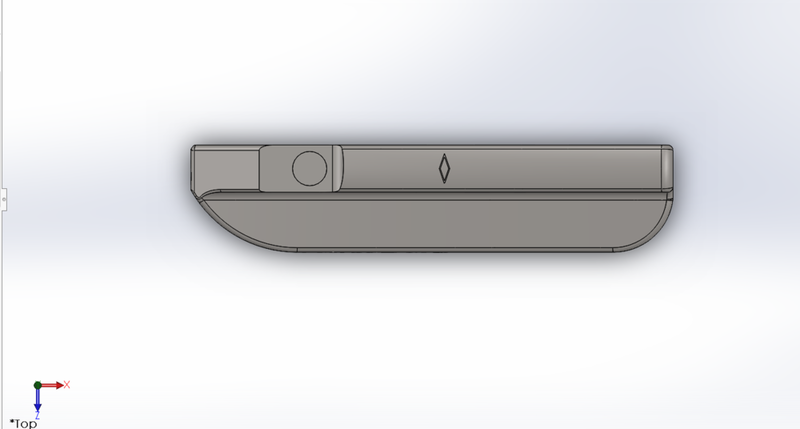 I am taking suggestions on designs to be apart of my 100 putter designs for the year. Some of these will be showcased at the Japan Golf Fair in Yokohama this March 23rd-25th at Pacifico Yokohama, 1-1-1 Minato Mirai, Nishi-ku, Yokohama-shi, Kanagawa 220-0012, Japan. For those of you who can't make it there we will be posting updates here with photos and videos. We might have an event during the year with one of our partners to showcase our quarter point at 25 pieces midday way point at 50 pieces and our final stretch points at 75 and 90 pieces. Top putter has been polished and coated with black PVD other two putters have not been polished as you can see the wood grain style markings.